Paridhi is shown standing looking at Vatsal and Kanchi. She spots Jeevika and calls her. 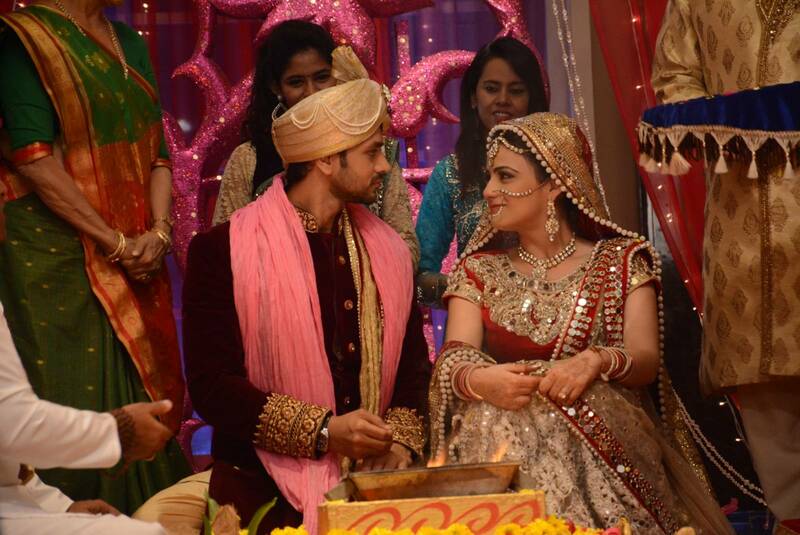 What have u people thought abt Kanchi’s wedding ? But they would get her married if they find a good boy right ? Paridhi grins and walks away. Is it u too or only me who thinks something is fishy ?? Its only u . pagal. Maya pats jeevika’s head and walks away. Anahita frowns – kaanchi..where is kaanchi ? Ranveer smiles – its okay mom. Maya di is my eldest sister. She will do my gathbandan. Maya comes and does their gathbandhann. Maya smiles – may god bless this jodi. May u guys have all the happiness of the world. May u be blessed my prosperity, success and children. Vivah ka yeh gathbandhan itna masboot ho..ki koi todna toh dur ki baat..dheela bhi na kar paye..
She hugs both of them. Pandit ji – gath bandhan ki vidhi samapt hui ! pheron ka muhrat shuru huwa ! Ishveer start the phera. All shower flower petals on them. Jeevika – . They promise to nourish & take care of each other’s needs. Shivaay – In this, the couple pleads to God to give them mental stability, spiritual strength, and physical health so they can live a smooth life. Anika – They also promise that from today they are two souls and one heart and will always to be there for each other to ensure laughter and smiles. Shivaay Anika reminise their pheras. Arjun – the couple prays for wealth, prosperity, and wisdom to live life peacefully and with contentment. They ask God to give them enough strength so that they can share the happiness and pain together. Maya – During this phera, they also promise each other to be utmost faithful and never cheat in this relationship for any third person. Maya and Arjun remember their wedding time and hug each other. Sajnaa Ve, Sajnaa Ve, Sajnaa [x2]. Laksh – Marriage is believed to be about two families and not two people. The vows recited during this phera highlights the commitment between the two souls to increase in love and respect for each other and their respective families. Ragini – In this, the bride is also said to walk before the boy and promises that she will accept death before him if it ever comes on his way. Laksh and ragini think about their wedding and smile at each other. Sanskar – In this phera, the couple promises to be with each other in every thick and thin and share joy and grief. They also pray to God to bless them with healthy kids and promises to nurture them well with good values and an enriching lifestyle. Swara – in the sixth phera , the couple asks for a fit and healthy long-life filled with joy, prosperity, and peace. They promise to always stand next to each other in bad health or when needed and support each other in all devotional duties. Swara smiles and puts her head on sanskar’s shoulder . he cups her face. Sajna Ve, Sajna Ve, Sajna [x2]. Pandit ji – In this final round, the couple prays for loyalty, togetherness, companionship, understanding and unconditional love between themselves. They ask for enough patience & maturity to make this beautiful bond last long.They also promise to do every possible thing to carry out all the promises taken during this holy ritual with pure and honest intentions. the pheras are completed. All clap. Pandit ji – phere sampann huwe !! Twinkle and Kunj are shown . they are shown standing in front of the mandir corner. Kunj is shown talking on call. Hello yaar…ha don’t worry. Im wearing kunj’s sandals. No one can steal it and no oe candemand money. Yes. Haha ! Twinkle – kunj..u know why today is a pecial day for us. Right ? Kunj – yes darling. I know. He removes the sandals and they enter the mandir. Twinj close eyes and pray. Twinkle opens her eyes and winks at Naira. Naira winks back and takes away the shoes of the groom. Kunj opens his eyes. Twinkle hugs him suddenly. I love u too..but…budduram kyu ??? Wait beta ji..pata chalega soon..
Twinkle laughs and runs away. Kunj looks on confused. He screams – oh no..juta!!!!!!!!!!!!!!!!!!!!!!!! Whole venue is shown shaking !! Pandit di – sindoor daan ka muhrat shuru huwa…. Ranveer fills Ishani’s hairline with vermillion. Tears of joy drip down ishani’s eyes. he wears her the mangal sutra. they smile widely. Naira is shown standing with shoes . kartik comes . naira hids them. I have something for u .. He gives her a bracelet. This muyst be very expensive na ?? Naira smiles. He breaks the hugs. I have work hm.. see ya ! Naira smiles – ab jute..wait…jute!!!!!!!!!!!!!!!!!!!!!!!!!!!!!!! Whole bali is shown shaking !!! All families are shown standing. Pandit – ab saath vachan ki baari…. Jeevika – dulhan kahegi ..
#I am responsible for the home and all household, food and finance responsibilities’. He kisses his baby shivi. Anika – ab dulhan bole..
Shivika smiles as this matches their story. # May we grow wealthy and prosperous and strive for the education of our children and may our children live long. # I will love you solely for the rest of my life, as you are my husband. Every other man in my life will be secondary. I vow to remain chaste’. She remembers Aditya and wipes her tears. They smile and hug each otherss. Swara smiles at him – dulhan vachan degi… I promise to love and cherish you for as long as I live. Your happiness is my happiness, and your sorrow is my sorrow. I will trust and honor you, and will strive to fulfill all your wishes’. They remember their moments and hug each other. Laksh smiles – dulha bole.. Now that you have taken six steps with me, you have filled my heart with immense happiness. Will you do the kindness of filling my heart with happiness like this for all times? Ragini holds his hand – dulhan vachan degi… I will always be by your side’. They think their memories and hug. Pandit ji smiles – vivaah sampann huwa !!! Precap – Juta Churai…Bidaai..Griha Pravesh..wedding dinner…Twinj are shwon in varmala..Dadi gets heart attack. The post Sajna Veh – Epi 41 – “The Sindoor Daan” appeared first on Telly Updates.